Since moving to western North Carolina I have run into John and Melissa at social events in Weaverville and Marshall. In fact, I ran into them at the soiree I wrote about a while back and they invited me to visit them at Highgate Farm. This was back in October; but I assure you the delay in writing this post is not my fault. It’s Melissa’s and John’s fault. I fell in love with their dog, which resulted in a new puppy at our house. He rules our lives. I don’t have time to write. All John and I do is separate puppy from cats, chickens, our legs, coats, socks and furniture. And we take him for walks and apply pressure to the wounds he makes on our hands with his little needle puppy teeth. So you see, it’s not my fault. I have been thoroughly distracted. Back on that October day, I gassed up the Guzzler and listened to Tony Rice on the way out to Madison County. From Weaverville I drove toward Marshall, North Carolina on 25/70. As highways go, it’s pretty; our state plants perennials in medians and roadside beds. Past their peak on that October day, plants lined the highway in faded green and brown; tired stretches of cosmos and day lilies. Blue and purple mountains rose in layers ahead; to the east, some blue sky and the late day slant of autumn sun. To the west, soft hills draped in gray mist and deep shadows, evening chasing the day away. I could see downpours in the distance. The temperature had dropped 15 degrees since noon and it was cold and windy. I called Melissa to ask if we should reschedule, she told me the sun was out for the time being. I found Indian Grave Gap Road, then their switch back driveway. I parked and walked up toward the house in cold, blustery wind and watery sunlight. Melissa met me halfway. We walked up to the flat acre they are planting these days. The world would be a better place if we all had offices with this view out the window! I asked Melissa about the history behind the road name, Indian Grave Gap. She pointed toward the high mountains and said, “Well, there’s a gap up there with some Indian graves in it. That’s about it.” Funny girl. Melissa told me they bought the land 7 years ago. They couldn’t afford the farm and a house, so they bought a $5,000 camper and lived in it for a long time. Now John farms full-time and works three local markets; Melissa works full-time in the health care field and on the farm. They’re busy folks. John uses a walk-behind tractor that has multiple attachments. That makes total sense, one engine to maintain, all the tools you need to get the job done. Also, their old Mercedes and the tractor run on bio-diesel, B20, which is 20% bio-diesel and 80% petroleum. They have a drip irrigation system set up to water the crops. At Highgate Farm, they grow 3 varieties of sweet potato (I wrote down Covington and Bonita) missed one name somehow. They grow Irish or white potatoes, onions, spinach, mesclun mix, salad turnips, purple top turnips, Swiss chard, broccoli, cabbage, 3 varieties of Romano beans, and beets; green, red, and Savoy cabbages, cauliflower. They grow sweet and hot peppers; yellow, green and red bells, poblano, and Hungarian hot wax. They are also growing strawberries, blueberries, blackberries, and wine berries. Wine berries? Never heard of them! Melissa showed me a fuzzy red cane and very shiny berries. She said they’re raspberry-like in flavor, originally from Asia. Their laying flock pecked and foraged nearby, 38 hens and a rooster. Usually, they have an intern or two help them during the spring and summer growing seasons. The interns get room and board in exchange for 20 hours per week working on the farm. About this time, John joined us and brought Kelly with him. 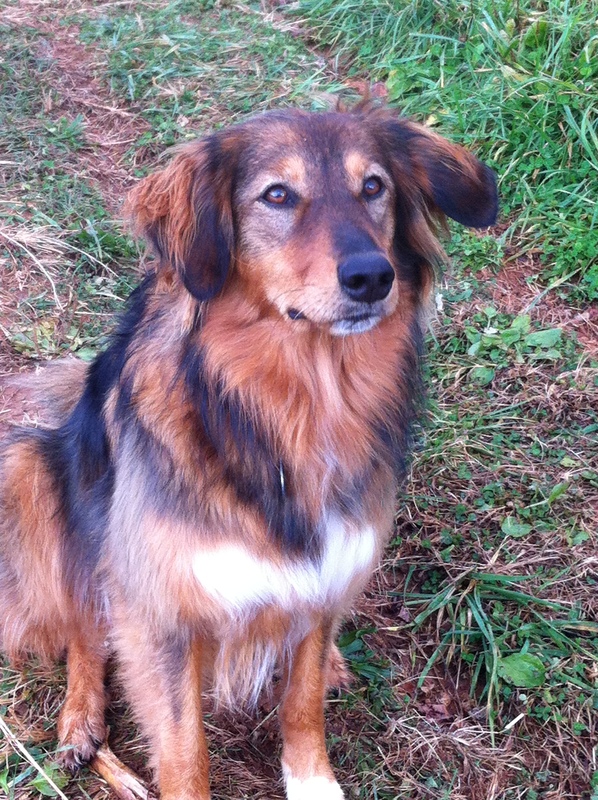 Kelly is an English Shepherd, a breed I had never heard of before that fateful day. She was sweet-natured and soft as could be. Kelly was persistent in demanding pats on the head, but polite about it. She had very good manners. And that face! I couldn’t get enough of her. I was doomed. John said she chases the crows out of their crops for them and keeps the varmints away. They told me she is a great farm dog and a great family dog, too. Sold! 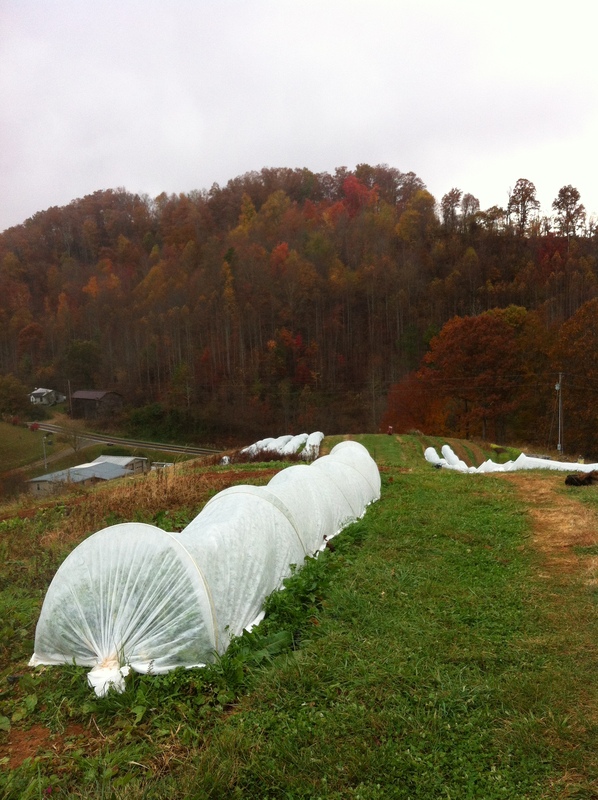 John and Melissa had covered most of their crops with hoops and frost cloth already, but I got to peak under them. 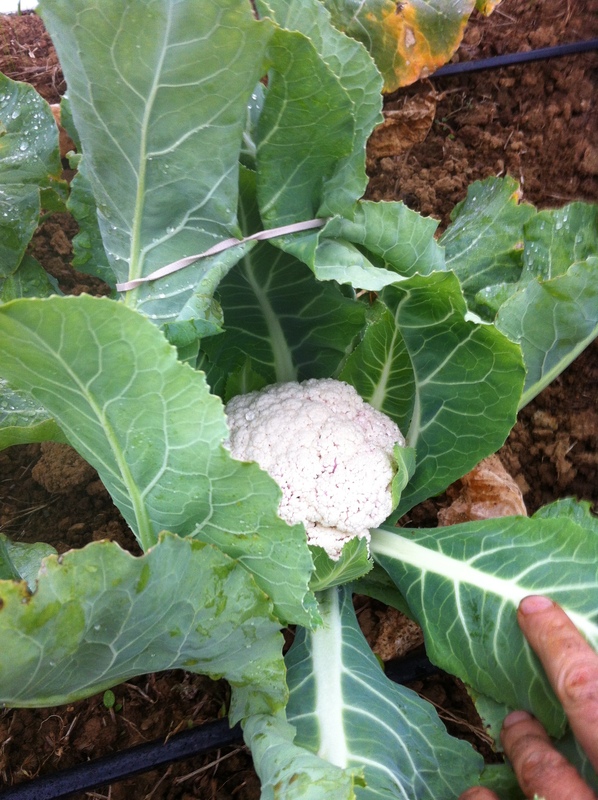 Isn’t that the prettiest head of cauliflower you’ve ever seen? I get hungry just seeing the picture. They are cultivating about an acre of raised beds. They had other cool weather crops under the cloth. (Good thing, it was getting colder by the minute.) About that time, the wind picked up and the rain pelted us like cold pennies. We ran for the greenhouse. Rain drops splashed my legal pad and the ink ran. John showed me his notebook – six years of notes on everything they’ve done on the farm, all the seed and plant records, successes and failures, general day-to-day farm notes. NOT ONE SMEAR. Apparently a company called Rite in the Rain makes this little miracle notebook product impervious to water. Who knew? I want one. 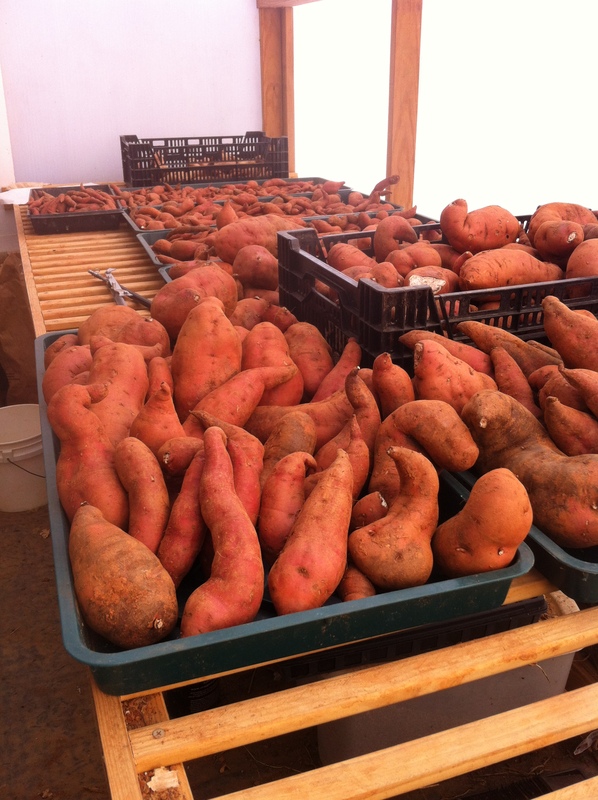 In the greenhouse, it was warm and earthy smelling, with racks of sweet potatoes curing. They were kind enough to fill a bag of taters for me, but I forgot them. 😦 I fussed over Kelly, while Melissa and John told me about the markets where they sell products; the Weaverville Tailgate Market, the East Asheville Tailgate Market, and the Black Mountain Tailgate Market. They also sell greens to a little place we love – the Pork and Pie restaurant in Marshall. I have been to the Weaverville Market, Highgate Farm has a booth that looks like a work of art, rows of veggies placed just so to show off their colors and textures. I mentioned that, John said he had worked in merchandising for several years. It shows! John and Melissa found the plans on-line and built the greenhouse themselves. They said the only problem they have had are mice! Melissa told me about the day they had painstakingly filled racks of cells with scallion seeds, 6 seeds per cell. Next morning, all were gone! Little mice had brought in an army and carried off their hard work! Little rats! I asked if Highgate Farm was certified organic, John said it was not. I was curious because I have heard that it is difficult and expensive to get certified. Instead, John and Melissa explained that they are part of a group called Certified Naturally Grown, or CNG. Certified Naturally Grown is a non-profit founded by farmers in 2002. If offers a peer review program to members; in other words, farmers inspect each others’ farms to make sure they meet the required standards set forth by the organization. There is a beekeeping arm of CNG as well. I read about the group, I liked what I saw. 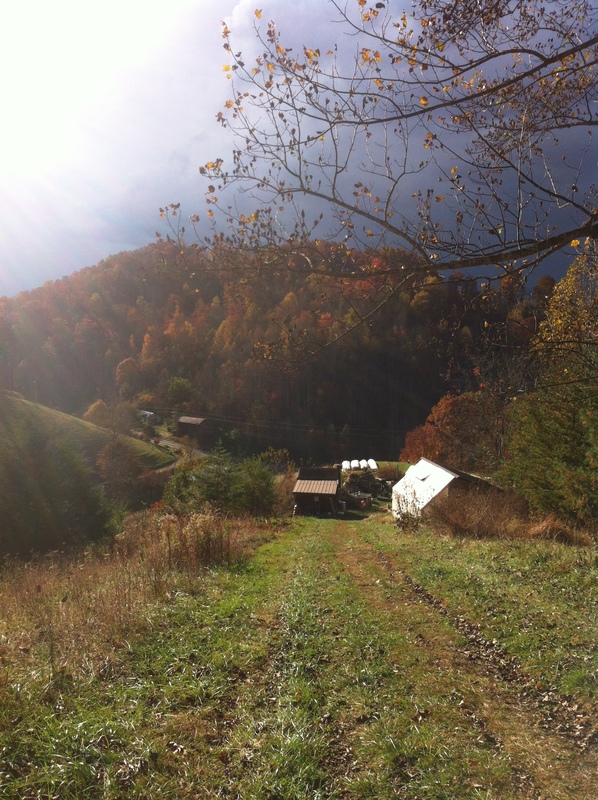 It is so much more practical than organic certification, especially for the small farm. John and Melissa invited me up to the house for a beer. I accepted. They have built their house themselves over the past couple of years and aren’t done yet. There are nice big windows facing the view. It was warm and cozy, one of the cats sat next to me while I had brew. I found myself growing drowsy in the waning light, so decided to head for home. Ordinarily, I would apologize for taking so long to follow up after a visit. But it’s their fault I have a puppy. So I won’t. ← Why did the Chicken Cross the Road? The beautiful and descriptive immediacy of Mary’s writing is always SUCH a pleasure More more….. Your pup melts my heart (swoon).